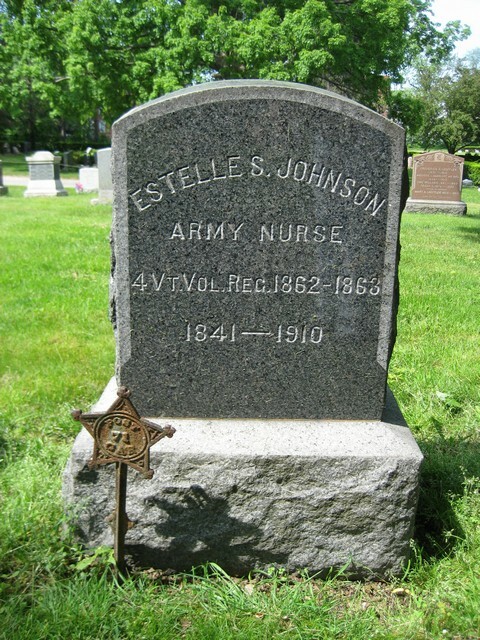 I have been requested to write what I can remember about my life as an army nurse, while in the hospital of the 4th Vermont Volunteers. I hardly know what to say, as it is new work for me to write for a book. When the war broke out I lived in a little country village shut in by the mountains of Vermont. One day in August, 1861, Leonard Stearns came in search of recruits. My husband and his brother-in-law were among those who enlisted, and sister and I objected, naturally; telling the recruiting officer that if our husbands went we should go too, but not thinking that such a thing could be. In the course of a week Mr. Stearns came and told us that the colonel said that although nurses had not been called for, he wanted us to go. The boys formed a company under Capt. Leonard A. Stearns, and went into camp at Brattleboro. They were assigned to the 4th Vermont Regiment, Company I. On September 18th we were sent to join them, and on the 20th signed our names - Estelle S. Johnson and Lydia A. Wood - to the roll, and were sworn in by Lieutenant Higby, in the presence of the colonel, adjutant, and major, the Governor of Vermont and his son-in-law. The Governor tried to persuade us not to go. The regiment started about eight o'clock that evening, and went by rail to Stonington, where they embarked for New York, arriving there the next day in the forenoon. Thence by rail to Philadelphia, where we arrived in the evening, and marched to Cooper's Hall, where a collation was prepared for us. I do believe it was the best meal I ever ate; we were very hungry. Late that night we went on board a train for Washington, and this time we did not get along very fast. It seemed as if we only crawled, so slow was our progress. A few miles beyond the Relay we found the rails torn up in a piece of woods; but they were soon replaced, and we proceeded on our way, reaching Washington about eight o'clock in the evening. The colonel found a place for sister and I to rest at the "Soldiers' Retreat,'' where Ave had supper, lodging and breakfast; then went to join the company. From the depot they marched to Federal Hill, where the tents were pitched September 23d. I had left a little girl at home, who was one year old that day. We stayed there a week; then the 9th Wisconsin came on the ground. It was raining hard, and the colonel would not move his men, so sister and I took the seven ladies who were with the regiment into the tent with us over night. One thing I must mention before we leave Federal Hill. Away in the distance was stationed another regiment. One evening near sunset we were looking over there, when we saw some men drawn up in line to shoot a comrade for desertion. I did not see the shooting, but I heard the report of the guns, and knew another poor fellow had paid the penalty of desertion. September 28th we again started on the march. We crossed Chain Bridge, and halted that night close to Fort Smith. Only one tent was pitched; that was for the women. When all had turned in and were nicely settled for sleep, an order came to go into the fort, as an attack was expected; but we stayed in our tent outside and slept soundly all night. Next day we crossed the road, and pitched the tents on a slight elevation. This place was called Camp Advance. Here we were assigned to the 1st Vermont Brigade, Brig. William F. Smith commanding. We stayed here nearly two weeks. The 2d Vermont was not far away, and there were five women with them, and some of the boys were from our home. Once we visited them. Soon after we moved on, and pitched our tents at Camp Griffin. Here was a level strip of ground, with a large corn-field on one side. A day or two later the long roll was called before daylight. That day the camp was shelled by the rebels, but the shells did not reach us. The captain wanted sister and I to go back to Langley; but I told him if he thought we would run at the first fire he was greatly mistaken. As soon as possible a hospital was established, a few miles from camp, in a deserted house. I went there as nurse, or, as Dr. Allen called me, "matron." In this house there were three rooms and a kitchen on the first floor, and three above; the one over the kitchen being a low room, with roof sloping to the floor and with no light. Here some of the boys were lying, with nothing but their rubber blankets under them, and for some time no regular sick rations were issued. One day Robert Langdon came over to see us from the 2d Regiment. He reported to General Brooks how the boys were situated, and things were made lively for a day or two. The old house underwent a thorough change. Cots were made, and ticks filled with straw, hay, or cornshucks; and soon the boys were comparatively comfortable. I occupied one of the upper rooms, and kept there my hospital stores. Many of the soldiers were sick with typhoid fever, and my husband soon had it. I slept very lightly, and often was called to get the necessary things in which to lay out some poor fellow who had died in the night. From my room I had to go down stairs by passing through a narrow hall just the width of a door. Here was where they laid the dead, and sometimes there would be two, side by side, and it would be hard to pass them in the narrow space. It gave me an awful feeling to crowd by them in the dead of night. We had been at the hospital about ten days when sister Lydia was taken sick with the fever, and died the ninth day. Robert Langdon brought Amanda Farnham and Mrs. Black to prepare her for burial; but the boys could not bear to have her buried as the soldiers were, so clubbed together and paid the expense of having her embalmed and sent home, and her husband with her. He arrived before the coffin did, and that night was taken down with the black measles. She was kept three weeks, then buried beside her little girl; her husband getting there just after she was buried. After her death my husband was much worse, and for days it was doubtful whether he could live or not, but he slowly recovered. The care of him in addition to my other duties kept me busy and from being homesick. When he became convalescent, Dr. Allen wanted me to go to the Brigade Hospital in the same capacity in which I was serving there; but I objected to going so far from my husband, who would soon return to his company. I remember many of the boys so well. One called Phillips would be up and around one day, the next would be very sick. Chaplain Smith came often to see him; but as he grew worse he was sent to the Brigade Hospital, where he lived only one week. There were two Bailey brothers, and the doctor said there was nothing the matter with them but homesickness. Nearly every day I would go to them and read, or perhaps write letters for them, but they soon died. Another, Charlie Persons, had black measles. I used to go to him every day and do all I could. One evening an attendant came to tell me Charlie was dying. It was only too true. There he lay, his hands clasped over his head, apparently sleeping, but, really, quietly passing away. I took from under his pillow the picture of his lady-love, and this with other things I sent to her, - all but her letters, which I burned, for fear curious eyes might read them. I went to Washington twice with Surgeon Allen. The first time I stopped over night with Miss Dix. Her house was filled with supplies. I shall always remember that visit. The next time Amanda Farnham and I went to get some needed things. We went to Georgetown in an army wagon, then walked on from there. Being very hungry we went into a bakery for something to eat. When the German woman who had charge saw our uniforms, she invited us into her kitchen to have some dinner, and would not accept any pay. Well, in course of time my husband went on duty again, but it was too soon, and the fever settled in his right knee, so I had him under my charge once more. March 21, 1862, the sick were all sent away, as preparations were being made for an advance; my husband being sent to Alexandria. Surgeon Allen said he would never be able to march again, and he had to get a discharge. After this I did not feel that I could stay; but they said as he had a discharge I should not need one. How I have wished since that I had it. This was just before the battle of Lee's Mills. I left the regiment March 23,1862, and reached home April 3d, my service covering only a little over six months; and as our regiment was not in any battle during that time, I had no wounded to care for, and have no thrilling adventures to relate. I hope you may have Amanda Farnham's experience. Mine will be nothing beside hers, for she was out during the whole war. She was married after I left. I do not know her present name, or if, indeed, she is living; but if she is I hope she may read this, and that I may hear from her. 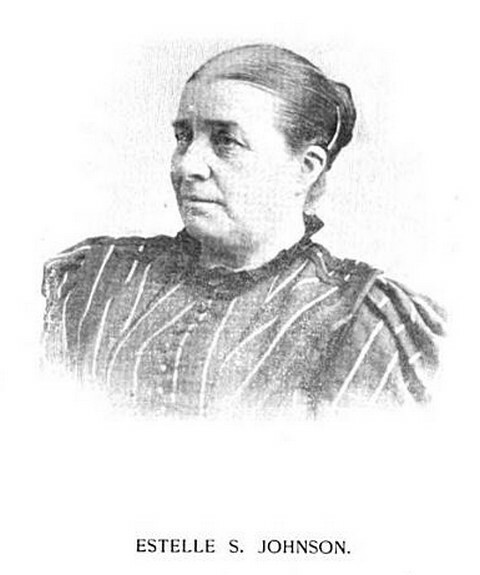 Estelle Serena Read, daughter of Charles Davis and Oliver Charlotte (Willard) Read, was born in Wardsboro, Vt., 2/2/1841. 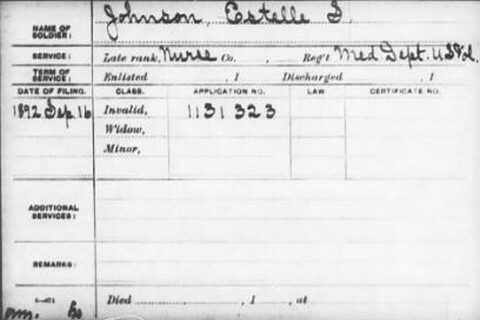 She married Judson Rufus Johnson, of Jamaica in 1859; he served as a Sergeant in Co. I, 4th VT INF. His sister, Lydia, b. abt 1836, also a nurse, married Arad T. Wood, a Private in the same company. 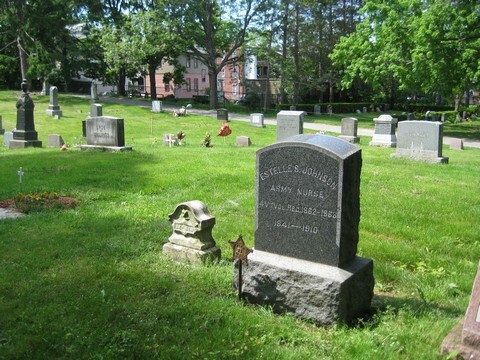 Lydia died at the front on 11/7/1861, and her remains were returned to Jamaica, VT for burial.